Bruk skjemaet til venstre, eller ring oss på 77 05 84 44. Takk for henvendelsen, du vil få svar i løpet av kort tid. Røkenes Gård og Gjestehus ligger i Harstad, Sør-Troms. Gården er fra ca år 1750. og fungerer i dag som restaurant og selskapslokaler. Vi ønsker våre gjester velkommen til et godt måltid i vår en atmosfære vi tror bare finnes her på gården. Uforstyrrede omgivelser med nåtidens mas og jag på god avstand skaper rammen om begivenheten. 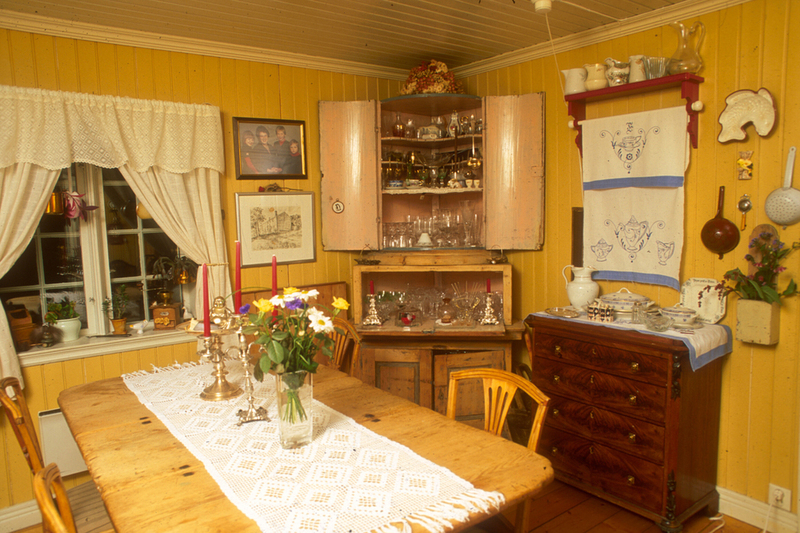 At Røkenes Farm we welcome our guests to dine on the finest china and crystal in a beautiful Nordland house from 1750. 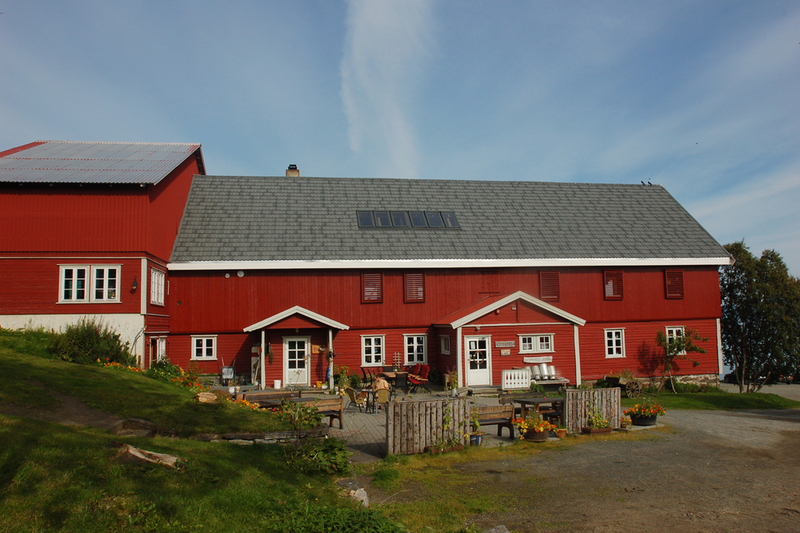 Røkenes Farm is about the closest one gets to a really large farming estate in Northern Norway. Owned and run by the Kulseng family for 10 generations, since 1673, we first hear of Røkenes in the 14th century, when the property was given in penitence to the Church. However, the farmland was probably first cleared as far back as AD 300-400. The coastal trade in fish from north to south and in imported goods from south to north, was most important from the 1500s onwards. In 1777, Røkenes was granted a Royal Licence to Serve Wine and Liquor – a huge draw at the time which attracted much activity to the farm. Also part of that activity was fishing and farming in what was a very large estate by the standards of Northern Norway. The “stabburet” (storehouse), from the early 1700s, is the oldest building on the farm. The elegant farmhouse itself dates from 1750, and is a long, narrow, wooden house built in the traditional Nordland manner. 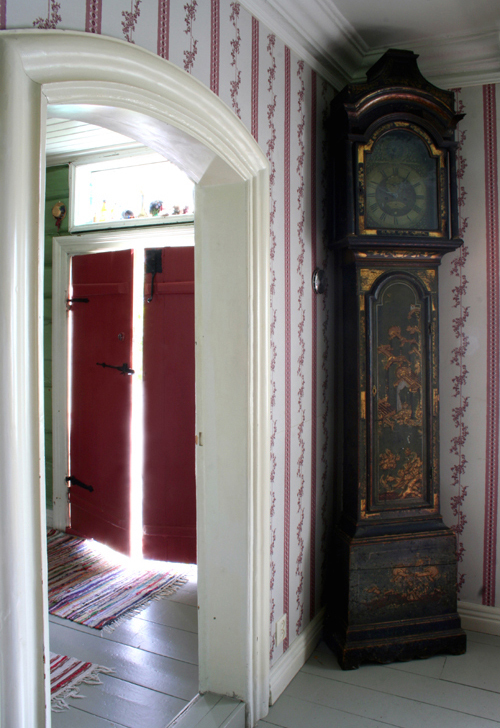 The fine doorway is richly carved in Rococo style, showing a keen awareness of the architectural trends of the age. 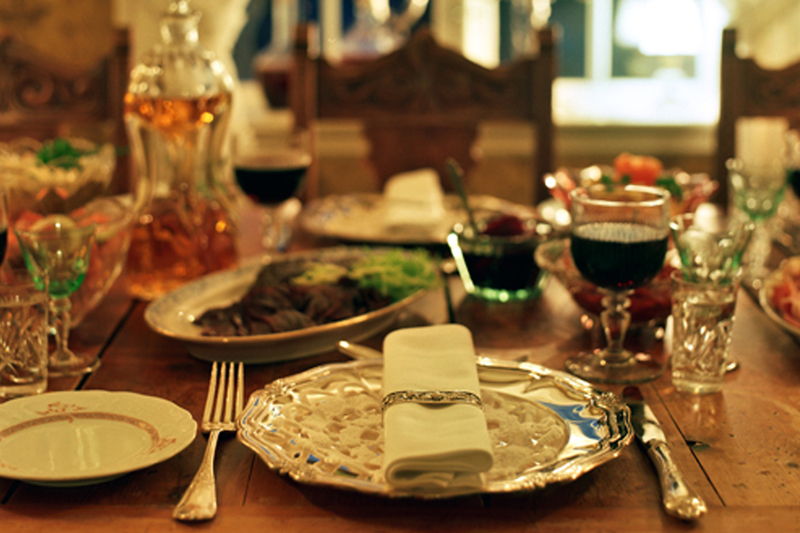 from the 1730s, the displays of crystal and silver; all these things have followed the family through the generations. 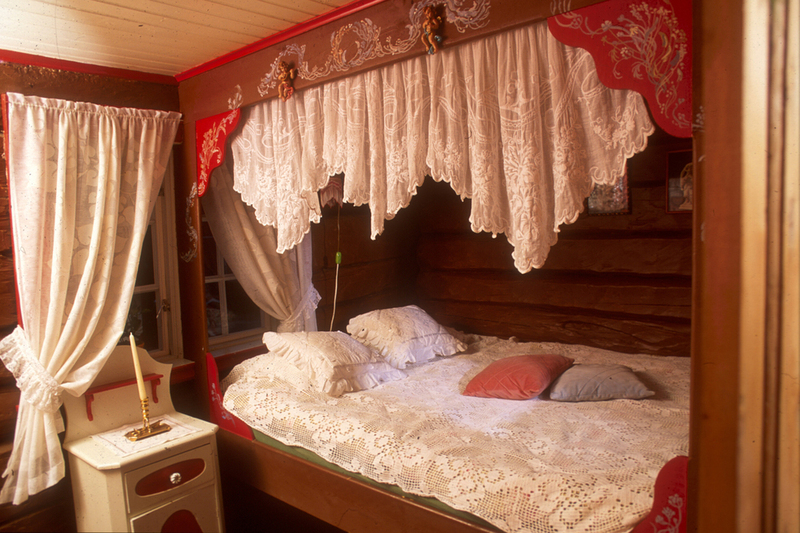 Silk wallpaper, heavy curtains and drapes, and floorboards that are not quite even, tell us that we are in an old house where generations of Kulsengs gaze down on us from their oval picture frames. Dinner in Northern Norway is often a hearty and rustic sort of meal. Dinner at Røkenes with beautiful porcelain and crystal is an altogether more stylish and elegant affair. The ingredients come from the rich farming area around Harstad and from the sea beyond. The way they are prepared, however, is more characteristic of French and international culinary traditions, as would have been the case on a prosperous estate like Røkenes. An introduction to the fascinating history of Røkenes from the owners is all part of the experience. a guesthouse and restaurant, the cowshed was converted into a banqueting hall, art gallery and outlet for the sale of local arts and crafts. Pictures by the well-known Harstad artist, Karl Erik Harr, are on permanent display. Wooden beams, braces and uprights, made from logs floated up river from Namdalen in 1899, form a surprisingly modern aesthetic under the high open roof space, which stretches through three floors. The Kulseng family lived in Botswana for eight years in the 1980s. When the cowshed was converted and the silo was empty, they brought together all the objects and mementoes from their time in southern Africa and furnished the space as an “Africa Room”. Masks, spears and shields in rich, earthen African colours keep alive the memories of this important epoch in the family’s life. 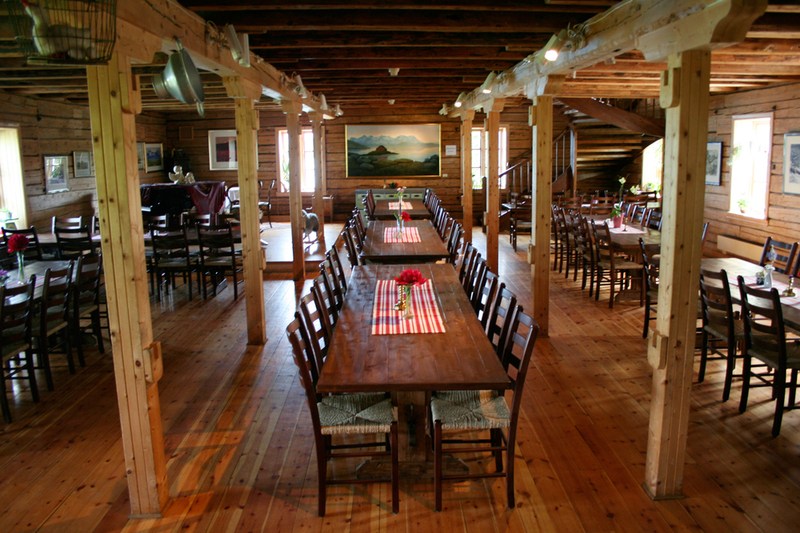 Throughout the three summer months, the restaurant at Røkenes Farm is a popular place for lunches and dinners. For the rest of the year, the restaurant is open on Sundays and the people of Harstad flock here to enjoy their Sunday lunch. Conference dinners, banquets, weddings, Christmas parties and major birthday celebrations fill the rest of the week. The old two-storey storehouse with its own little bell tower has been beautifully restored, and provides cosy guest accommodation. 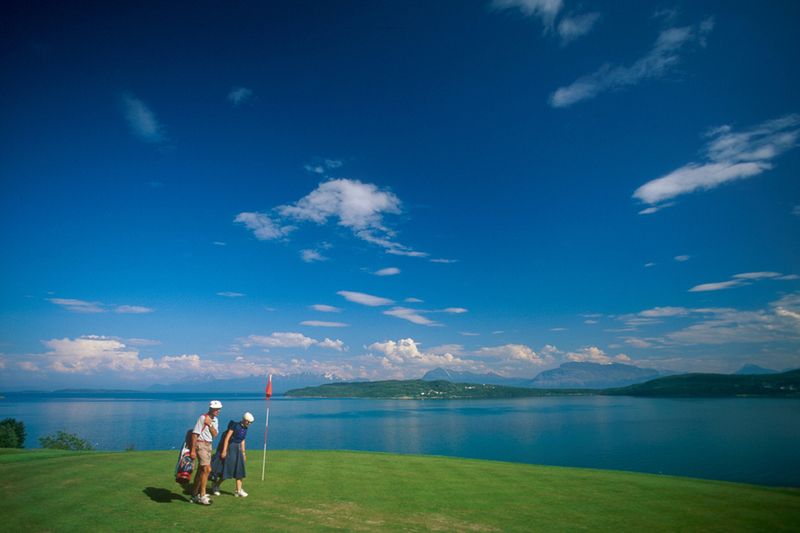 On the land outside the farm is a nine-hole golf course, situated in undulating terrain high above the fjord and offering fabulous views. The idea of siting a golf course here was not because golf was a particularly refined activity appropriate to the elegant surroundings, but was to keep the cultural landscape open and to preserve it in its original state, preventing it from becoming overgrown or developed for housing.